This look’s actually entirely by accident. I was in Kuala Lumpur for the weekend, and stopped by the huge Sephora near Pavilion. On a whim, I went by and asked if they had the Sephora Cream Lip Stains in stock. I was so excited to see they had some of the colours there – I recognized Infinite Rose – but not Always Red, my HG red. The sales lady said they haven’t received any stock for about four months now. D= The story is the same in Singapore. It doesn’t seem like it’s been discontinued because the entire line is still on sale on the US Sephora site. I’m now begging friends studying in the US to help me purchase it so I can get hold of it when they return for Christmas; sort of like an early Christmas present to myself. I got back early this morning, and after lunch a friend came over to my room to play with my makeup. I picked up Sephora Always Red and just started to apply it (no makeup on at this point). It felt like a waste to just wipe it off so I kept it on. 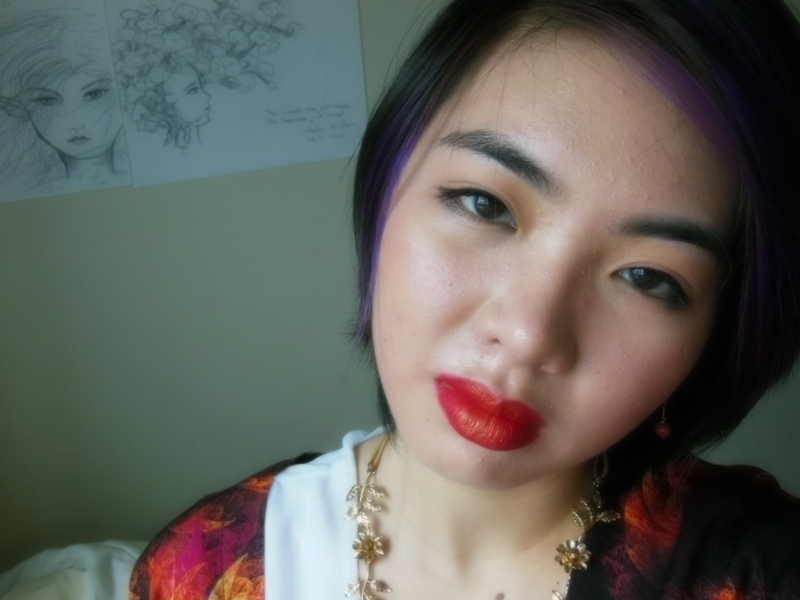 The red lip is so overwhelming though, so I toned down the rest of the makeup. 2) I then patted the tiniest bit of OCC Triptych (molten jewellery gold) on top of my lip. The final effect looks like Chinese red paper – the heavy matte red paper that has a little gold foil on top. I love it. In other news, I got my eyebrows threaded while I was in KL. I’ve threaded them once before, but the woman was not very thorough, and they still looked much the same. I’ve been plucking them myself since, because I don’t trust anyone else with my eyebrows. Have you noticed how Indian women always have the most gorgeous eyebrows? I went was at a beauty parlour run by a group of Indian ladies and after seeing their eyebrows figured that they’d understand that I want mine groomed, but still thick and natural. I’m happy to report that they did a fantastic job. Threading though, was one of the most painful experiences of my life. And I had to sit still and hold my eyebrow taut for the lady doing the threading. D= Results are worth it though. This entry was posted in Looks and tagged Beauty, Cosmetics, happy skin second skin creme foundation, hourglass mood light, jane iredale amazing base loose mineral powder, mac smolder, MAC warm soul, makeup, maybelline rocket mascara, occ triptych, sephora always red lip cream, soap and glory thick & fast, urban decay naked 3. Bookmark the permalink. 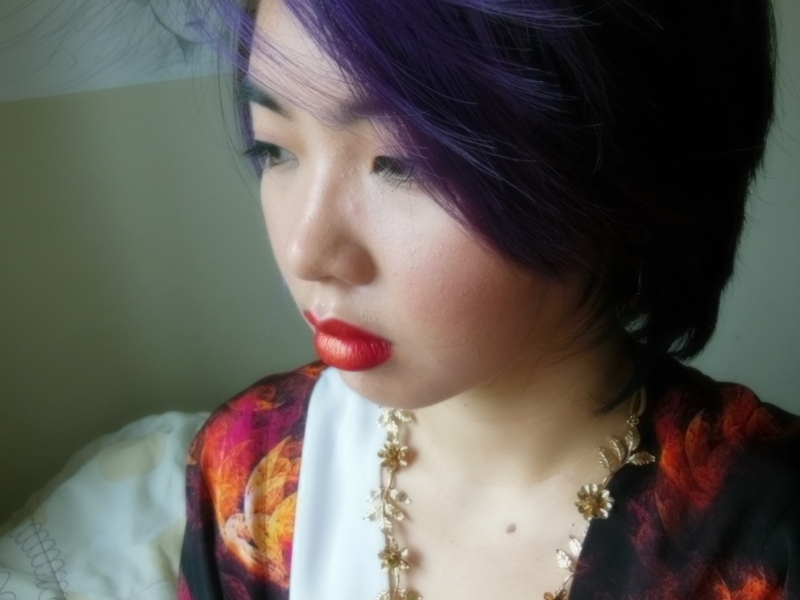 I love Occ triptych over heavy lipsticks. Yes, Triptych is great! I like using it to lighten a heavier colour, but a small amount for that gold sparkle is great too.